Printed gift certificates are mailed directly to the recipient (or to you) with coordinating gift envelopes. Electronic gift certificates are also available upon request. Gift certificates expire FIVE years from the date of issue. No refunds. SAVE $25 when you purchase THREE gift certificates! Purchase gift certificates for individual sessions any time of year. *Checks can only be accepted when ALL of the following: drawn on a U.S. bank; written by a returning client or designated corporate account contact; NOT a starter check. Massage packages with Autumn are a great way to commit to feeling great this year. SAVE $30 on three massages, SAVE $70 on six massages! 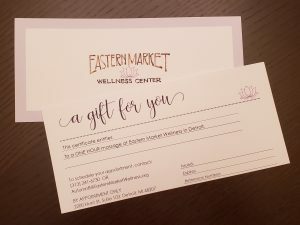 Massage packages expire ONE YEAR from date of issue. No refunds.